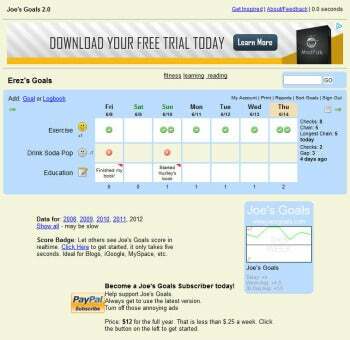 Joe's Goals looks a little quaint, but its tools for goal management are versatile. Joe's Goals, an ad-supported free service, has been around for years and looks a bit dated. That said, it offers more options than the slicker-looking Chains.cc. You can use Joe's Goals to track habits that don't require daily repetition (for example, if you have an exercise routine you do every other day). Joe's Goals can also track bad habits: For example, if you're trying to quit smoking, you can use Joe's Goals to log every day in which you've smoked. Each day gets a numeric grade composed of the number of good habits minus the number of bad habits you've logged for that day.